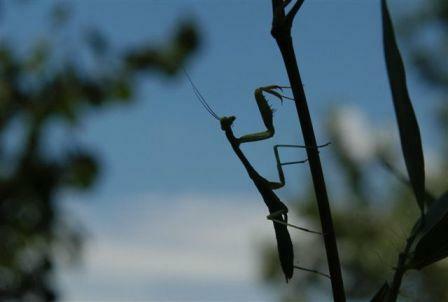 Scientific Name: Order Mantodea, family Mantidae, Mantis spp. Biology and Life Cycle: One generation a year. Hibernate in the egg stage. 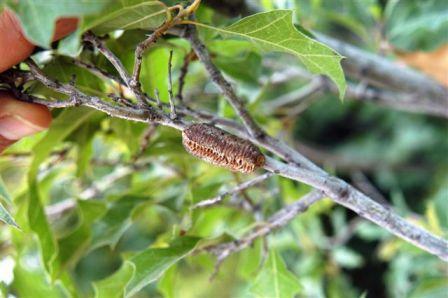 Adult females glue fifty or more eggs together to form an egg case. Wingless nymphs emerge from slits in the side of the egg casing in the spring and feed on larger and larger insects as they grow. Habitat: Most food and ornamental plants. Feeding Habits: Nymphs and adults feed on aphids, beetles, bugs, leafhoppers, flies, bees, caterpillars, wasps, butterflies, and anything else that ventures by, including small animals like lizards and snakes--also each other. Economic importance: Questionable. They are interesting insects but undependable for control of problem insects. Natural Control: Various insect parasites. Insight: These insects are friendly to people and even make good pets. But they will eat any insect, including their own kind. They like caterpillars, grasshoppers, beetles, and other critters. They are not discriminating and eat beneficial as well as pest insects. 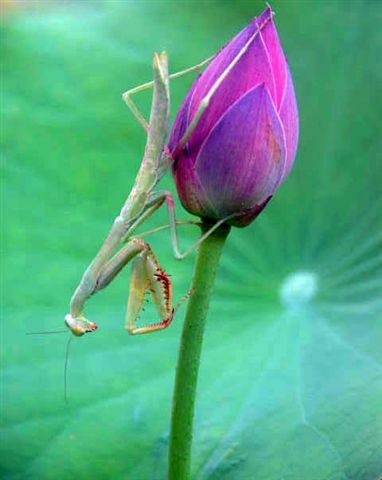 However, Malcolm says he has never seen a praying mantis eat a beneficial insect other than old worn-out bees. So they are pretty good pest control helpers. They can even be used indoors.